238 pages | 230 Color Illus. The Royal College of Surgeons’ of England two-day “definitive surgical trauma skills course” is run by the authors. 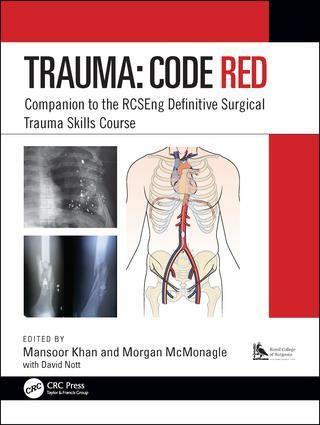 The course began in 1997 but a new syllabus has recently been put in place.The focus is on thoracic ,abdominal and vascular injuries, caused by both penetrating trauma, such as a knife, and ballistic trauma caused by guns.This Manual accompanies the course and it's aim is to “demystify the body” and show how to control massive blood loss. Interventions, whether they be military or civilian, are descrbed in full, and techniques derived from the battlefield and world-wide hotspots in trauma —are exemplified within this book. Mansoor Khan, MBBS (Lond), PhD, FRCS (GenSurg), FEBS (GenSurg), FACS, AKC, is a Consultant Trauma Surgeon at the North West London Major Trauma Centre based at St Mary’s Hospital, Paddington as well as a Surgeon Commander in the Royal Navy. After graduation from King’s College London in 2000, he undertook his House Officer training in Plymouth and Portsmouth, followed by three years of military posts. In November 2001 he graduated from Britannia Royal Naval College in Dartmouth and was deployed in the Northern Arabian Gulf on military operations upon completion. The remainder of his general duties saw deployments in the Baltic and North Sea on NATO’s Immediate Reaction Force of Minehunters, the 2003 Gulf War and counter narcotics deployment in the Caribbean. Upon completion of three years of military general duties, he commenced surgical training completing his rotations in Peterborough, Birmingham and South Yorkshire. After having successfully obtained his FRCS in General Surgery in 2010, he was subsequently deployed on tour at Camp Bastion in Afghanistan, followed by a 1-year Trauma Critical Care Fellowship at the world-renowned R Adams Cowley Shock-Trauma Center in Baltimore, Maryland, USA. He was appointed as consultant general surgeon in the Defence Medical Services of the United Kingdom, and subsequently was awarded Fellowship of the European Board of Surgery and Fellowship of the American College of Surgeons. Since appointment as a Consultant Trauma Surgeon he has undertaken multiple operational tours in addition to lead clinician for the military team awarded the Military Civilian Health Partnership Award, 2014 for Team of the Year. He is a member of the American Association for the Surgery of Trauma. The current military positions include; Consultant Advisor in General Surgery to the Medical Director, General Royal Navy and senior lecturer in military surgery at the Royal Centre for Defence Medicine. Civilian positions include Honorary Senior Lecturer at Imperial College London, National Institute for Health Research (NIHR) academic, editor/associate editor and reviewer for multiple journals, undergraduate and postgraduate examiner, Co-Director of the Definitive Surgical Trauma Skills course at the Royal College of Surgeons of England as well as faculty on multiple international surgical training courses. He is keen on research and has published extensively with over 170 publications, book chapters and conference papers. His interests include primary injury prevention research, blast mitigation strategies, haemorrhage control, trauma education, physiological monitoring and studying the gut microbiome in relation to trauma and hypoperfusion. Morgan McMonagle, MB, BCh, BAO (Hons), MD, FRCSI, FACS is a consultant trauma surgeon in the North West London Trauma Network based at St Mary’s Hospital, London and a general and vascular surgeon with the South/South West Hospital Group in Ireland. After graduating from University College Dublin (UCD) with honours in 1997, he undertook basic surgical training at the Royal College of Surgeons in Ireland (RCSI) hospital group after which he gained further trauma surgery experience at Westmead Hospital, Sydney, Australia. Following this he gained extensive experience working in prehospital care and aeromedical retrieval with Careflight? and Careflight? International, Australia and later with MAGPAS air ambulance in the United Kingdom. He completed higher surgical training with the West Midlands surgical training programme, UK followed by a Vascular & Endovascular Fellowship at the Royal Brisbane & Women’s hospital, Brisbane, Australia. He then undertook additional fellowship training in trauma, emergency surgery and surgical critical care at the world renowned and prestigious trauma programme Penn-Trauma at the Hospital of the University of Pennsylvania, USA, after which he was awarded fellowship of the American College of Surgeons (FACS). As well as being faculty on the NECPOD report Trauma: who cares? (2007), which was instrumental in the development of the UK trauma network, he was the first trauma surgeon appointed at Imperial Healthcare as part of the new London Trauma Network. He was also faculty member on the steering group advising on the document A Trauma System for Ireland: Report of the Trauma Steering Group for the Department of Health, Ireland. Positions include teaching faculty at the Royal College of Surgeons of England (RCSEng) in addition to Director of the RCSEng Definitive Surgical Trauma Skills course and a contributing author to e-Learning for Healthcare, NHS Health Education England. He is a clinical lecturer in surgery at the Royal College of Surgeons in Ireland (RCSI) and a senior clinical lecturer in surgery at University College Cork (UCC) and an honorary lecturer in surgery at Imperial College, London. He is an Intercollegiate Examiner in vascular surgery and the author of one other award-winning vascular textbook. He regularly lectures internationally, including visiting professorship to the University of Athens on disaster and conflict medicine. Interests include; trauma education, trauma systems development, trauma protocol development, management of penetrating injury, complex aortic disease, complex lower limb revascularisation, pharmacological suppression of neointimal hyperplasia, vascular trauma, management of non-compressible haemorrhage, pelvic trauma, trauma thoracotomy, management of postpartum haemorrhage, biomarkers for shock and haemorrhage and management of the open abdomen, including abdominal wall reconstruction.